I had a profound experience many years ago that shed light on the crux of my issues. I had been saved for about fifteen years at the time, and I was already at Christ Tabernacle, the church my husband and I pastor. Christ Tabernacle is the first church to be birthed out of the Brooklyn Tabernacle, which is the church where I first experienced God’s presence and learned about faith and prayer. So you can imagine how honored and elated I was when I was asked to be a speaker at their very first women’s retreat. Then I heard the question that changed my life. I thought about it for a quick second and started to weep profusely. Oh, I believed He loved others, but me? I had to admit to myself that I didn’t believe Jesus really loved me. I knew in my head that He loved me, but I realized that I truly didn’t believe in my heart that He loved me. I was eighteen inches—a foot and a half—from victory. This was where my deep issues had their root, from where all my trust issues stemmed. The Holy Spirit neatly wrapped up every feeling of insecurity, worthlessness, and fear in an instant and narrowed it down for me by identifying my double-mindedness. The belief that God loves us is the critical truth on which the rest of our faith hinges. The failure to believe this is the difference between living our life trying to gain God’s approval and living our life knowing that we already have His approval. Ladies and gentlemen, Jesus is our defender. 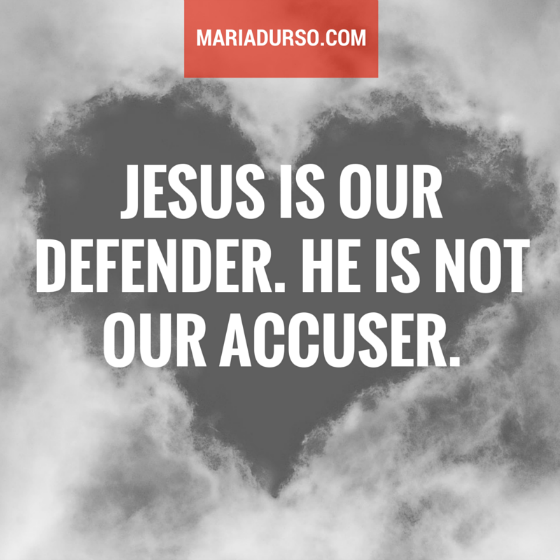 He is not our accuser. “For the accuser of our brothers and sisters, who accuses them before our God day and night, has been hurled down. They triumphed over him by the blood of the Lamb and by the word of their testimony” (Rev. 12:10–11, emphasis added). What is the word of our testimony? It is that we are unconditionally loved by God, and if God loved us enough to save us, then who are we to argue with Him? I believe it’s time to wash the brains of our hearts, or should I say, it’s time for us to get a much-needed brain wash.
We are just eighteen inches from victory. Let’s ask God today for the grace to see that He is our defender. Make your prayer personal. Holy Spirit, reveal to me that You are my defender, not my accuser. As You reveal this truth to me, please start to wash my heart and lift all the residue of the past. I believe that as I absorb the depth of this heart-healing truth, I will make progress, and the distance between my head and heart will definitely be shortened. In Jesus’s name, amen.